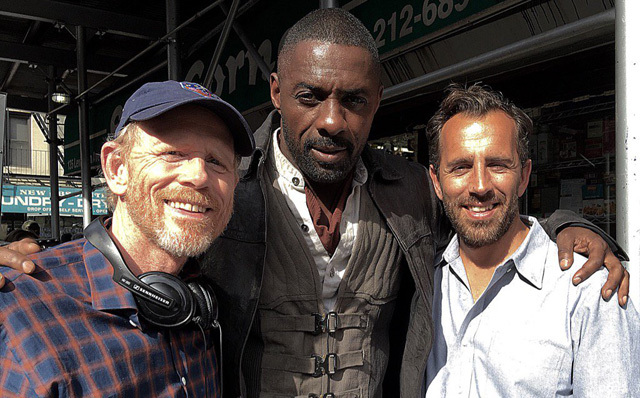 The long-awaited film adaptation of The Dark Tower continues to wreak havoc on the streets of New York, this time in the Dumbo neighborhood of Brooklyn where Idris Elba lived up to his Gunslinger character name while doing battle with Jackie Earle Haley as “low man” Richard Sayre, as well as with rooftop henchmen. During the explosive battle, Elba’s Roland Deschain (aka The Gunslinger) shoots it out with Sayre, who has tracking dots to add CGI enhancement later on, most likely the ever-present pool of blood as described in the novels. Stephen King fans will also note the sign for “Barlow & Straker’s Furniture Shop” in the background, a nod to “Salem’s Lot.” You’ll find the links to both Dark Tower set galleries in the Just Jared article tweets below, and check out more set pics in our own gallery! Elba and Matthew McConaughey are joined in The Dark Tower by Abbey Lee (Mad Max: Fury Road, The Neon Demon) as the film’s female lead, Tirana, and Fran Kranz (The Cabin in the Woods) as Pimli, the right hand man of Flagg. The film also features Jackie Earle Haley (Watchmen, A Nightmare on Elm Street), Katheryn Winnick (Vikings) and Claudia Kiim (Avengers: Age of Ultron). Series creator and author Stephen King previously seemed to imply that the forthcoming film wasn’t a direct adaptation of The Dark Tower book series but actually a continuation, focusing on Roland’s final cycle in his pursuit of the titular location. The film’s director, Nikolaj Arcel, and King also previously said that the film would be different from the books, potentially further teasing that the movie is both an adaptation and a sequel to the series. Arcel, who co-wrote the Swedish version of The Girl with the Dragon Tattoo and directed the Academy Award-nominated A Royal Affair, is at the helm the big screen adaptation, set up through Sony Pictures and MRC. Academy Award winner Akiva Goldsman (A Beautiful Mind) and Jeff Pinkner (The Amazing Spider-Man 2) wrote the screenplay. It is scheduled for release on February 17, 2017. What do you think of Idris Elba in action as Roland Deschain? Will Jackie Earle Haley make an excellent Can-Toi? Let us know in the comments below!